(A) IgG1 proteolytic cleavage by the papain (Fab, Fc, F'c) or the pepsin (F(ab')2, pFc' (also designated as pep-F'c)). F'c results from a papain digestion in presence of Cyteine. Due to the domain organization of the immunoglobulins, Fab and Fc of all Ig classes or subclasses are frequently constructed by recombinant engineering. 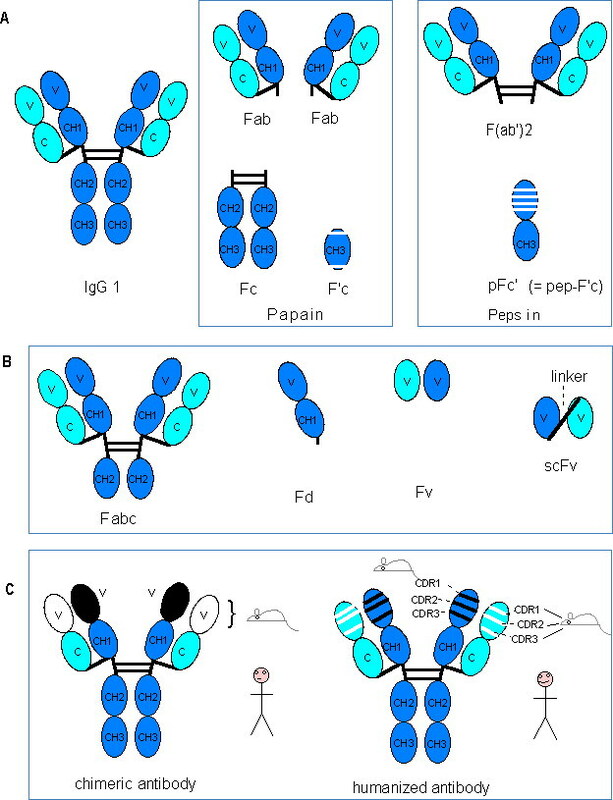 (B) antibody engineering: Fabc, Fd, Fv, scFv (single chain Fv). Combinatorial library scFv are frequently displayed at the surface of filamentous phages. A disulfide Fv (or dsFv, not shown) correspond to two disulfide-stabilized Fv molecules [1, 2]. (C) antibody "humanization" : chimeric antibody and humanized antibody. The murine (or other species) sequences which confer the antibody specificity correspond to the variable domains (V) in a chimeric antibody, or to the CDRs in a humanized antibody. Murine (or other species) sequences are shown in white (light chains) and black (heavy chains). The human light and heavy chain domains are shown in pale and dark grey, respectively. CH1, CH2, CH3: constant domains of the C-REGION of the heavy gamma chain.